Already since the 17th century goods were transported from the German Hinterland-Manufactories with carriages and hand-carts to ports and from there shipped to other continents. These transports were by no means a trend, but a witness to the first steps of the ever-advancing globalisation. Since then, other transport options have evolved: in addition to the “classic”, for centuries, used sea transport, the delivery by air, rail and truck is the standard now. sennder specializes in road transports – after all, this is a 300 billion € market. The demand for goods has also increased, among other things, by the generally increasing prosperity, as well as the World Wide Web. The goods must be transported from all parts of the world to the end customer. Each transport method has its own advantages and disadvantages and is suitable for different transport orders. The quantity, size, and weight of the goods to be transported, their shelf life or perishability and the time and cost of transportation are decisive factors thereof. For long distances, a plane in comparison to a container ship can carry a relatively small amount of transport goods, however, transport those relatively quickly from A to B. Ships need considerably more time to cover a certain distance. What about the overland transport? Railway lines exist in the UK, Germany, and France already since the 1880’s and enable since a simpler intra-state transport, are local but not limited. Rail transports are suitable for very large quantities of goods and are as good as independent from other road users, i.e. no traffic jams or accidents, which can result in transportation delays for trucks. However, transport routes on rails are very rigid and inflexible. The laying of rails is costly as well as time-consuming and labor-intensive. New infrastructure can only be used with large time delays. Furthermore, the loading of the trains can be done only with complex and expensive technology, such as special crane devices. This may be some of the reasons why there are only 163 registered railway undertakings in the field of rail freight transport Germany-wide. On the other hand, more than 90,000 companies are registered in road haulage sector – a considerable difference. 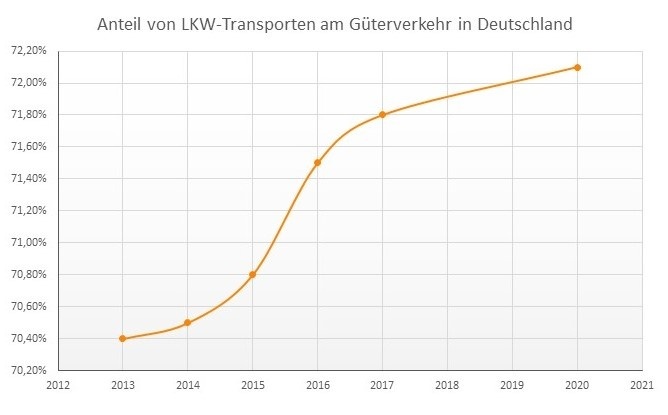 The demand for truck transportation is according to the statistics portal Statista getting bigger and bigger. In Modal Split, i.e. the distribution of transport volumes on different roads, trucks have taken in 70.4% in freight transport in the year 2013. For the year 2020, almost 2% more is predicted. This means for the industry that the increasing demand for road transport must be complied with. Accompanied by this is less empty trips or vacant vehicles, but also a redistribution of eg. railway transports onto the road. The two modes of transport train and truck do not have to exclude each other, however. The construction of transshipment stations allows for the reload of goods from one means of transport to another, such as. from trains to trucks or vice versa. This type of cooperation often takes place in the area of the last mile, i.e. the last part of the transport route “up to the front door of the customer”. Another example of a cooperation shows the Eurotunnel, with the truck being transported on rail systems under the English channel. Once the trucks reach the mainland they continue independently. In this way, the transport companies save time and money, because for them the transport in the Eurotunnel is cheaper and faster than making the seaway with a ferry. Collaborations can reduce transport costs, among other things, significantly and make the product for the consumer, therefore, cheaper and more attractive. It remains to be seen what future developments will arise in the transport of goods. Exciting challenges will be the increasing use of drones or even electric-powered trucks, due to the environmental friendliness as well as fast and reliable deliveries can be guaranteed.